We knit to connect: to the past, present and future; to the land, animals, our environment and each other. By knitting with local fiber, we connect to our land, the animals it supports, and our heritage by appreciating shepherding and small scale farms. By knitting with fiber spun in small local mills, we connect to the people in our community and support their work. By knitting yarn dyed with low impact dyes and mordants, we connect to the environment and our future by minimizing our footprint. By choosing the best fibers and high quality methods at each step, we connect to ourselves to the present with yarn that beautiful and a joy to work with. The yarn we choose to work with has a story, and when we add our time, attention and love, we create pieces that are a pleasure to knit, use and cherish. At Squirrel Mountain Fiber Arts, my mission is to promote connections. 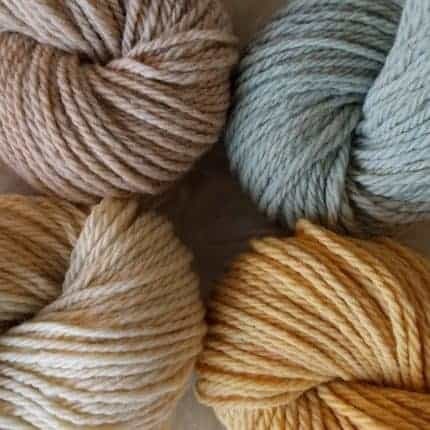 I do this by hand dyeing high-quality yarns that are sourced and spun here in New England (within 100 miles), highlighting natural dyes and nontoxic mordants.